I wanted to make easter play dough for T, as he's too young to understand the true meaning of easter, I thought that creating a hot cross bun play dough would be a nice way to acknowledge the religous aspect of Easter. Leaving the pastels for our other seasonal celebrations which are geared more towards the commercial side of easter. 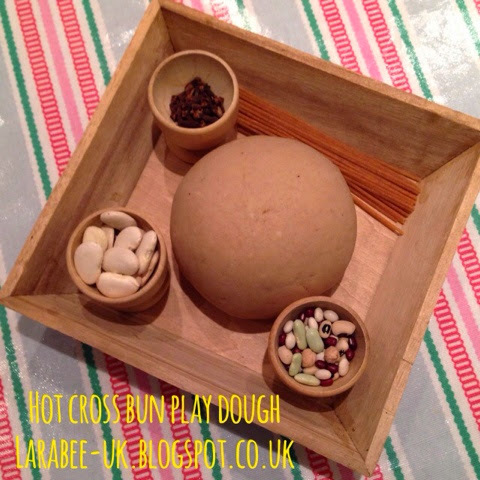 The recipe I use for play dough is here from @punquin on Instagram. I used this recipe for our glittery valentine play dough and it worked out great so I just used the same again, although I only used half the ingredients which produced 440g, a decent amount for 2 children. Mix the dry ingredients and spices together, then add the water, oil and lemon zest. Heat on the hob, stirring until it starts to form the familiar play dough texture. Remove from heat and tip onto a board, when cooled (just a couple of minutes) knead until smooth, keep covered in cling film when not in use. @punquin has a great picture showing the different stages, I'd highly recommend looking at this before attempting to make the play dough. I purposely wanted to keep this invitation to play quite natural and so have offered it with beans, cloves and spaghetti in a wooden box, I'm sure that it will be just as appealing as the brightly coloured set-ups that I usually give T.